View More In Wine Accessory Sets - Page 9. Entertain your guests in style with our elegant "Belgravia" wine cooler. 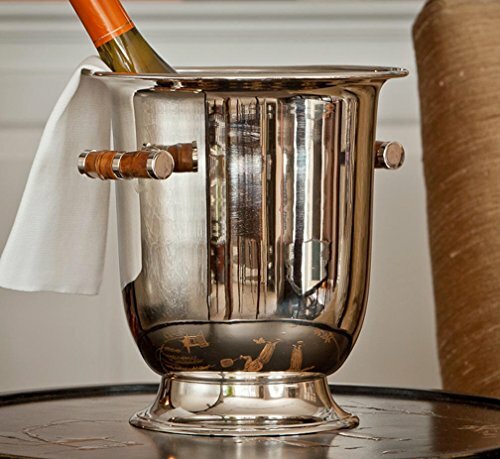 Beautifully hand crafted of brass with a gleaming nickel finish and decorative handles, our wine cooler keeps your favorite vintage at just the right temperature. Measures approximately: 8.8"Diameter x 9.6"H.
Beautifully hand crafted of brass with a gleaming nickel finish and decorative handles, our wine cooler keeps your favorite vintage at just the right temperature. Measures approximately: 8.8"Diameter x 9.6"H.